WHERE WILL YOU SPEND YOUR $500 CREDIT ON? *Terms & Conditions: Credit must be requested at the time of booking and will not be automatically allocated or retrospectively added. Credited option must be selected at the time of booking and can only be added to a Rocky Mountaineer package. Offer valid on new 2018 bookings made in between December 30, 2017 and March 2, 2018. 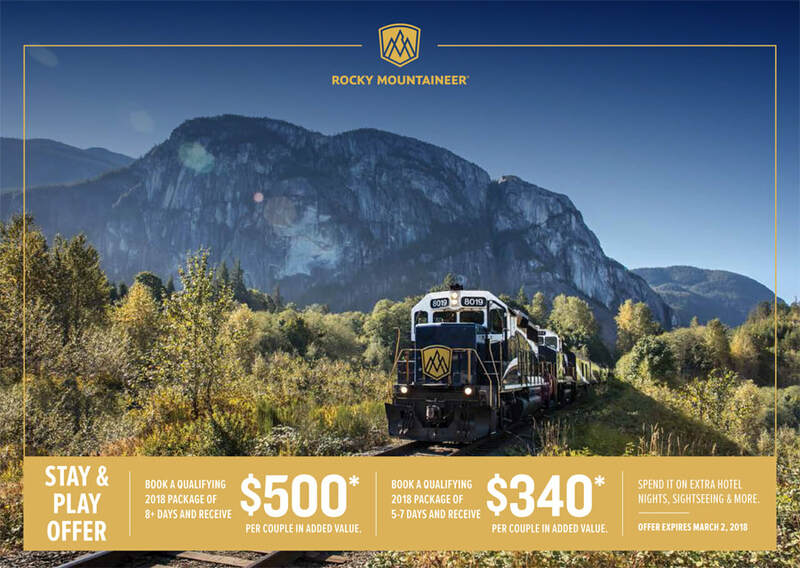 This offer is applicable to 2018 Rocky Mountaineer packages of five or more days on select dates only. Travel during the 2018 Rocky Mountaineer summer season between April and October on select dates. Deposits are required at the time of booking and full payment of the balance must be made 61 days prior to departure. Maximum offer value of $250 USD per adult added value ($500 USD per couple) is with qualifying holidays of eight days or more in GoldLeaf or SilverLeaf Service. Added value varies by duration of package. Qualifying packages of five to seven days will receive $170 USD per adult added value ($340 USD per couple). Applicable to single, double, triple or quad package prices. Qualifying packages can be purchased in any class of train travel or grade of accommodation. An amendment fee of $40 USD per booking will be charged for changes to the use of the credit after the booking has been confirmed. Credits can only be used towards the purchase of additional services offered by Rocky Mountaineer and upgrading GoldLeaf Service accommodation – the credit cannot be used to upgrade rail service. Offer value is expressed in USD as of November 1, 2017 as a guideline only and may vary at the time of booking based on changes in exchange rate with the CAD. Credit cannot be deferred to a later trip. Offer is not applicable to child prices, 2 or 3-day rail only bookings or Group Tour bookings. Not available in conjunction with any other offer. Offer has no cash value and is non-transferable. Offer is capacity controlled and may be modified, withdrawn or amended without prior notice. Additional conditions apply.